We’d love your help. Let us know what’s wrong with this preview of This Is Getting Old by Susan Moon. To ask other readers questions about This Is Getting Old, please sign up. Can anyone recommend another Buddhist book or memoir on the topic of aging? Thanks! One of the only things I do right is get old. Not that there’s a right way to get old, just that no matter what I do I keep aging. It’s one of the few things I’d prefer to fail at, but I guess this is the exception that proves the rule. When I was young I liked to think of myself as old. I loved the way the elderly dressed and copied their style. I enjoyed the company of those in dementia over the sharpies of youth. Of course, it’s easy to love what you’re not. Once I hit a certain age and my me One of the only things I do right is get old. Not that there’s a right way to get old, just that no matter what I do I keep aging. It’s one of the few things I’d prefer to fail at, but I guess this is the exception that proves the rule. When I was young I liked to think of myself as old. I loved the way the elderly dressed and copied their style. I enjoyed the company of those in dementia over the sharpies of youth. Of course, it’s easy to love what you’re not. Once I hit a certain age and my metabolism slowed, my joints hardened and my hair fell out, being old lost its romantic appeal. 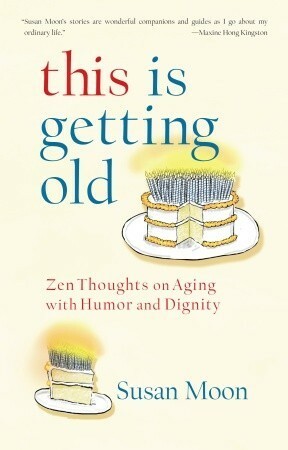 That’s why I eagerly picked up THIS IS GETTING OLD: ZEN THOUGHTS ON AGING WITH HUMOR AND DIGNITY by Susan Moon, I needed help to hate the endgame and not the dying player. But Moon isn’t about hate, she’s all about acceptance, which is hard for me to accept. I mean, sure, I know I’m going to die, I just don’t want to be there when it happens. Moon feels differently. She wants to be there. It comes from her Zen practice, which informs most of the essays in this collection. She talks about the loneliness of growing old, the loss of her mother, and other indignities, with, well, the humor and dignity promised in the subtitle. I really enjoyed this book. As some reviews already said, being a collection of essays, some spoke to me more than others. I particularly enjoyed her frankness about it all. Her pieces on becoming an orphan (when her mother died) and coping with depression REALLY spoke to me. As well as the aches and pains, and the worries over it all. If the reader is not a Zen Buddhist, they may find the Zen references too much. But I didn't. The book stands alone, without those bits. I particularly liked this I really enjoyed this book. As some reviews already said, being a collection of essays, some spoke to me more than others. I particularly enjoyed her frankness about it all. Her pieces on becoming an orphan (when her mother died) and coping with depression REALLY spoke to me. As well as the aches and pains, and the worries over it all. If the reader is not a Zen Buddhist, they may find the Zen references too much. But I didn't. The book stands alone, without those bits. I particularly liked this quote in the introduction: "As the Buddhist teacher Wes Nisker reminds us, we are called human beings not human doings. Laotzu said it, too, long ago: 'The way to do is to be.' We older people, forced to slow down in the doing department, have a leg up on being." Looked this over to see if it would be a good book for a relative and was disappointed it had so many words. They are only short essays but I sort of was hoping for pithy on-page insights and I found several page essays on really depressing aspects of getting old...falling down, not begin able to open jars, etc. We don't even like to think about those things, let alone read about them. Another reminder, if we ever needed one, to read the book first before you give it as a gift. Not a favorite. I had a lot of trouble with this. Perhaps because it was too true and real, perhaps because its California Zen author was too different from me although so much was the same. There are two quotes that I took to heart, however. I found this book via an offer from Amazon deals and as I was approaching my 70th birthday, decided to buy it. I’m glad I did. Ms. Moon has written a book that covers the gamut of experiences, thoughts, and feelings about being an aging woman. It’s constructed as a series of essays, every one of which had a nugget of meaning in it. She is a terrific writer, able to provide vivid descriptions of people, places and events that pull you right into her essay. She and I are very This. Is. Wonderful. She and I are very different people ... and yet, we are very much the same. She was a tomboy. Not me. She loved to hike and sequester herself in nature from childhood and beyond. Nope, not me. I’ve only learned to appreciate the outdoors as an adult, after I rid myself of my mother’s proscriptions about being outside, which wasn’t “ladylike”. She has always had an intense desire to surround herself with people and housemates though she has found living with a partner too difficult to sustain. She’s a caregiver to some degree and that has never been my thing. But ... we’re the same. We struggle with the physical limits imposed by aging even though we are otherwise healthy. She struggled with loneliness that was not of her choosing. She is highly introspective and has found being “in the moment” difficult. She is a reader and writer. She can be funny. And poignant. And she feels like a soul sister. I loved the essays about her mother and her ofttimes challenging relationship with her. Her reflections on the ways in which she was freed by her mom’s death to be her self despite missing her mother and being saddened by her loss, were deeply honest and authentic. And then there is her relationship with her bones (so funny!) and her brain. And let’s not leave out what it means when you realize you’re unlikely to have a sexual relationship with someone again .. more loss. A little freedom. Either way, a transition many, if not most, women make at some point in their lives either through choice of circumstances. Zen practitioner of 4 decades tells us of insights on aging. I can't be in more than one place at a time, but Zen practitioner of 4 decades tells us of insights on aging. Charming, tender, and very real. made me grateful aging is natural, even if I would prefer that time not go by so quickly. Enlightening, amusing, engaging. Very well-written. Lots of quotable sentences. A smart woman who has spent to much time wondering why she is single, and lots of time on the reasons her life is full and rich. I found it more agreeable in small doses. It took me a while to read this book as I kept putting it down. I expected to relate more than I did to her tales on aging but for the most part it seemed she was adopting a physical age far older than her 65 years. I need a zen approach to aging. This had humor, felt familiar, and gave me perspective. Liked it a lot at the beginning, not as much near the end. Part of this was probably my issues, but I think it may have fizzled, as well. This definitely spoke to me at many levels. Well worth it on many levels. Of course, I am older, single, and female but it is nice to know that I am not the only one. This book is written more like a diary that a novel but still entertains with some humerous moments as we can all realate to what it's like when getting old. It's funny how some things you would have cringed at when you were in your teens and twenty's only to find that you can't help but make light of them and share the experiences when olders. My only drawback was when the author talked vividly about when her mother was ill and passsed away as it brought back memories of my dad and his illness This book is written more like a diary that a novel but still entertains with some humerous moments as we can all realate to what it's like when getting old. It's funny how some things you would have cringed at when you were in your teens and twenty's only to find that you can't help but make light of them and share the experiences when olders. My only drawback was when the author talked vividly about when her mother was ill and passsed away as it brought back memories of my dad and his illness and death. Maybe it's just because not enough time has elapsed for me and the memories are still quite fresh that this was uncomfortable for me to read. I did hoot and howl at some of the really silly things that you say will never ever happen to you but I guess that fate does indeed have a sense of humor as it keeps throwing those monkey wrenches in front of you and you end up doing the dumbest of things. As you get older somehow things don't seem to be as embarrassing or maybe it's just because bordom sets in and at least your little mishap will bring some life to the party. Apparently many readers liked this book quite a lot. I liked it only a little. Susan Moon is a good writer; she is a witty writer; and, as her subtitle says, she makes many things about getting old funny. She also seems to suffer more than the average person - old or not - from depression, from loneliness, from a general feeling of isolation, and from an unfulfilled longing for something she cannot identify. There's a void there. Her Zen practices, which she never forsakes but never seems to be f Apparently many readers liked this book quite a lot. I liked it only a little. Susan Moon is a good writer; she is a witty writer; and, as her subtitle says, she makes many things about getting old funny. She also seems to suffer more than the average person - old or not - from depression, from loneliness, from a general feeling of isolation, and from an unfulfilled longing for something she cannot identify. There's a void there. Her Zen practices, which she never forsakes but never seems to be fully committed to, don't seem to help her much. In the wonderful Nora Ephron's books on aging ("I Feel Bad About My Neck" and "I Remember Nothing"), I fell in love with her, felt that she would make a fabulous friend. I didn't feel that way about Susan Moon. She seemed she'd be too needy. Still the book has its merits. Her chapter titles describe part of the aging process most of us can relate to. "Where Did I put My Begging Bowl?" i.e. short term memory lapses - what did I just walk into the room to get? "Leaving the Lotus Position" i.e. oh, my creaking bones! and so on. She also has an insightful chapter on her relationship with her mother and her mother's death. But her book finally left me unsatisfied. I very much enjoyed this book and rather want to purchase a couple of extras to give as gifts to other friends. The topic of her essays is very well-suited to where I am in life, and how I want to view life. It left me wanting to learn more, not only about the author, but about "Zen". The word, Zen, gets thrown around quite a lot -- now even in teas at Starbucks -- but I realized that I don't really know exactly what it includes...is it a state of mind when you're a Buddhist? ... Or is it a type I very much enjoyed this book and rather want to purchase a couple of extras to give as gifts to other friends. The topic of her essays is very well-suited to where I am in life, and how I want to view life. It left me wanting to learn more, not only about the author, but about "Zen". The word, Zen, gets thrown around quite a lot -- now even in teas at Starbucks -- but I realized that I don't really know exactly what it includes...is it a state of mind when you're a Buddhist? ... Or is it a type of Buddhism? I do know I greatly enjoyed another book with a similar perspective, called "Tomato Blessings and Radish Teachings" from another writer, Edward Espe Brown, which had a very similar way of looking at life. He was a Zen Buddhist, as well. I just finished this book this morning. Several of the essays made me laugh...a greater number made me cry (which probably looked really funny since I was reading most of it while on the recumbent stationary bike). I know I'm nowhere near the author's age (I'm probably just a wee bit older than her kids if that) but so much of what she talks about in all three sections of the book is what I think about on a daily basis (Mom always said I was 10 going on 40...so maybe I'm 40 going on 70 now). I a I just finished this book this morning. Several of the essays made me laugh...a greater number made me cry (which probably looked really funny since I was reading most of it while on the recumbent stationary bike). I know I'm nowhere near the author's age (I'm probably just a wee bit older than her kids if that) but so much of what she talks about in all three sections of the book is what I think about on a daily basis (Mom always said I was 10 going on 40...so maybe I'm 40 going on 70 now). I am thinking I am going to give this to both my sisters at some point eventhough they are not Buddhist nor are they "old." This book was a bit different from what I initially expected after reading the reviews but I enjoyed Susan Moon's exploration of her life and aging with all it's varied changes. Some of the story is humorous but more is contemplative, some quite sad as she deals with and seeks to find meaning in the changes we all face. Her point of view is heavily influenced by Zen Buddhism and there were occasional terms that I didn't totally understand, but that didn't really get in the way as the narrative g This book was a bit different from what I initially expected after reading the reviews but I enjoyed Susan Moon's exploration of her life and aging with all it's varied changes. Some of the story is humorous but more is contemplative, some quite sad as she deals with and seeks to find meaning in the changes we all face. Her point of view is heavily influenced by Zen Buddhism and there were occasional terms that I didn't totally understand, but that didn't really get in the way as the narrative generally explained all. A gently reassuring collection of essays. The author is older than I am (only about 10 years or so), but I can see there from here. The topics she covers -- physical infirmities, forgetfulness, depression, loneliness, the illness and death of parents and loved ones -- sounds horribly depressing, but she treats each one with humor and compassion. Highly recommended for anyone in their 50's and up, or who have aging parents. This was a thoroughly enjoyable read! I loved the humor and grace in the way that Susan Moon discusses so many issues and concerns that we all have about growing older. I also really enjoyed the Zen aspects to many of the chapters -- how she would describe an incident, problem or whatever and then flip the whole thing around and look at it from a completely different angle. This book can be enjoyed by anyone - whether they are Buddhist or not. I would suggest this books for my friends. Not sure what I expected from this book, someone older and wiser to tell me how to cope with the next stage of my life maybe. Instead I find someone who seems to be my own age already complaining about feeling frail! But I persevered and found we shared some life experiences and thoughts, although in other ways her life has been very different from mine. All in all, it seems to tell us more about being human at any age. It might seem odd or premature to read a book written about aging when I'm only in my 40s (though late 40s!) but considering that my aging mother lives with me, I was looking for insight. If you are a member of the sandwich or club generation (caught between children and aging parents) you might take a look at this book.